I’ve got a Whirlpool top mount that runs for a long time to satisfy the cold control. Many times it seems to trip the thermal overload as I can hear it click then restart. 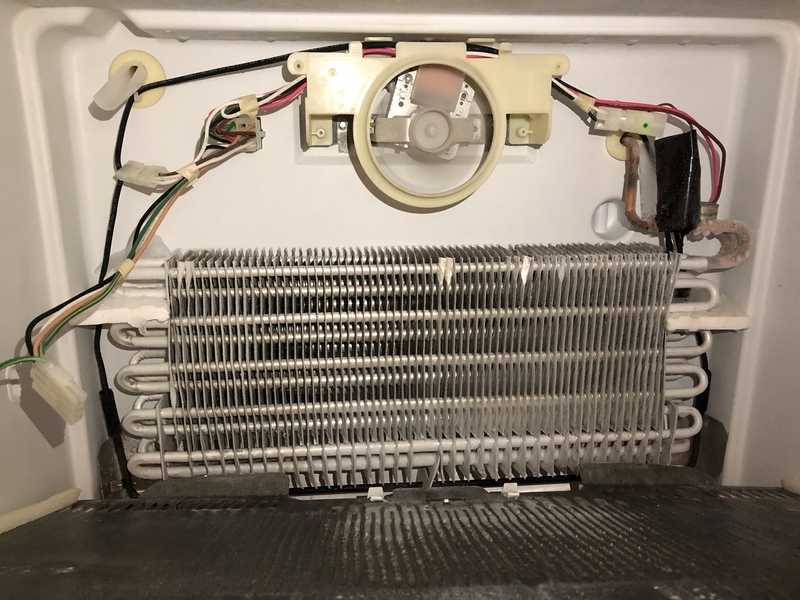 To troubleshoot, I’ve cleaned the condenser coils, checked for frost on the evaporator, and checked the defrost heater. The condenser fan is working fine as well. I also replaced the start coil and overload just because it wasnt a huge cost to confirm whether that was the problem. Is there anything I’m missing before I condemn the compressor? How did the frost pattern on the evaporator look? Can you post photo? Cabinet temps are good. I’m looking at 0 and 40. I’ve attached a photo of the evaporator coil. Sort of hard to tell, but doesn’t seem to be much frost on evaporator. Is entire evaporator covered in thin coating of frost? It’s very thin but mostly wet. When I shoot it with an IR thermometer it looks like it’s putting out -10 F.
How is your temperatures and compressor now since you changed all that out. ?? Temperature is maintaining, but the compressor is still running hard to keep up. It runs for a long time and I hear the overload kick off and the compressor eventually kick back on. My guess at this point is a low refrigerant/weak compressor issue. I think it might be time for it to go to the big refrigerator in the sky. HHMM the temperatures are maintaining. ? and the overload is still kicking out the compressor ? , it's possible the refrigerant is most likely fine but hard to tell from here. check your condenser temperature. It normally runs about 100 degrees . The compressor will pull about 2 amps normally running Make sure the interior light is not staying on as that can cause long running times and warm temps in your fresh food section. The compressor could be tired as you mentioned . The overload condition on the compressor is concerning though. You could possibly have a very slow leak in the refrigerant line and very possibly it is time to go to the fridge in the transfer station place. I haven’t checked amp draw yet, but the condenser temp is around 80 degrees. Would that be consistent with a bad compressor or low charge condition? Yes if it’s 70 degrees in the room. If it’s only 50 degrees in your room it’s ok. The ambient temp is 70, so it sounds like it is boned. Since I’m now shopping, is Whirlpool made still my best bet in a top mount? I see condensation at top ........perhaps an air leak ....bad door seals?